Thanks to a generous $750,000 gift from the Jim and Julie Cardwell Fund and the Cardwell Family Foundation, Texas Tech University Health Sciences Center El Paso (TTUHSC El Paso) is establishing an endowed chair in the department of neurology. TTUHSC El Paso is matching the gift, establishing the Jim and Julie Cardwell Endowed Chair in Neurology. The chair will be supported by a $1.5 million fund thanks to the combined gift and match. The gift and endowed chair are part of a long-term effort to increase the number of neurologists available to treat the El Paso community. The Cardwell Family Foundation is an affiliate of the El Paso Community Foundation. 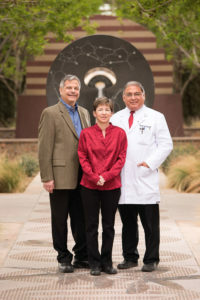 From left: Jim and Julie Cardwell; Salvador Cruz-Flores, M.D., professor and chair of TTUHSC El Paso’s department of neurology. Matching funds are being leveraged by TTUHSC El Paso to recruit and attract physicians in specialty areas that are underserved in our region. The goal is to build upon these specialties so that both patient care and research expertise expand over time. There are additional matching funds for endowed chairs and professorships in several areas, such as psychiatry, emergency medicine, orthopedics, surgery and internal medicine. There is a shortage of neurologists nationwide, leading to a “neurology desert” in areas with no neurologists. Though El Paso is not in that situation, with about 20 practicing neurologists, there are too few for a city this size, and El Paso patients are faced with waiting lists, said Dr. Salvador Cruz-Flores, professor and chair of TTUHSC El Paso’s department of neurology. According to the American Academy of Neurology, a city should have three to five neurologists for every 100,000 inhabitants – a minimum of 35 if there are 700,000 people in El Paso County. El Paso neurologists serve patients from the entire Paso del Norte region, Dr. Cruz-Flores said. About 45 percent of the care provided by neurologists at TTUHSC El Paso is uncompensated care for the uninsured or underinsured. Though part of their mission, Dr. Cruz-Flores said this adds to the need for more neurologists. For more information on how to make an investment in the future of health care in the Paso del Norte region and take advantage of matching funds, contact Andrea Tawney, associate vice chancellor of TTUHSC El Paso’s Office of Institutional Advancement, at andrea.tawney@ttuhsc.edu.